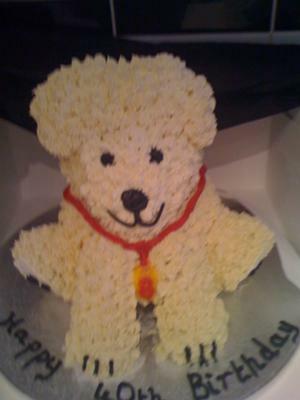 To make this Bichon Frise cake, I used a 3D bear mold with a rich chocolate cake an dark chocolate ganche. I cut off the top arms of the bear to make the paws. I covered the cake with white chocolate ganache and then piped the cake with the ganache. It was too difficult to get a really white color unfortunately.